FALLING is a two-minute thrill ride. 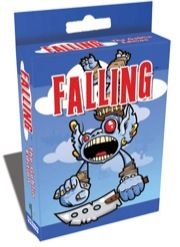 It's a freeform card game in which players are falling, fighting, and struggling to hit the ground last. There are no turns in this game. Everyone is playing at once. One player deals from a mostly-shuffled deck, while the other players play their cards in real time. The Dealer isn't falling; he just distributes the cards and moderates the game. The other players receive stacks of cards, like Skip, Stop, Hit, and Push, and try to cope with them as quickly and accurately as they can. Sitting on the bottom of the deck are five Ground cards: when you get a Ground card, you are out, and the last player to hit the Ground wins. To win a game of FALLING, you have to be lucky, fast, and clever. Or at least two out of three.